PanARMENIAN.Net - Chinese archaeologists have uncovered a 2,000-year-old bronze pot that contains an alcoholic liquid believed to be wine, CNN says. The discovery occurred on November 6 in China's Henan province, west of Shanghai. Shi Jiazhen, who is head of the Institute of Cultural Relics and Archaeology in the province's city of Luoyang, tells China's Xinhua news agency that "there are 3.5 liters of the liquid in the color of transparent yellow. It smells like wine." Wine has long played in a role in other important archeological digs. Shards of pottery dating from the Neolithic era (6000-5800 BCE) marked with remnants of grapes were unearthed in the country of Georgia in 2017. They contain some hints about the origin of winemaking there, nearly a full millennium ahead of when historians had previously believed the practice began. 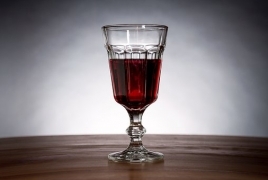 The pottery had traces of tartaric acid, which is what gives wine its tartness. Meanwhile, the island nation of Cyprus also holds claim to another historical wine accomplishment: Its Commanderia dessert wine is believed to be the oldest named wine in the world. Other than the as-yet-unnamed liquid, the other major discovery in the Henan province archeological dig this week was a large bronze lamp in the shape of a goose. Luoyang is rich with historical significance. Its location at the confluence of the Yellow and Luo rivers makes it an important center for trading. It has been the capital of many dynasties, including the Western Jin, Northern Wei and Later Tang. The city is home to the Shaolin Temple (sometimes referred to as the Shaolin Monastery), which is famed for its connection to kung fu, and the Longmen Grottoes Buddhist rock carvings, both of which are UNESCO World Heritage sites.